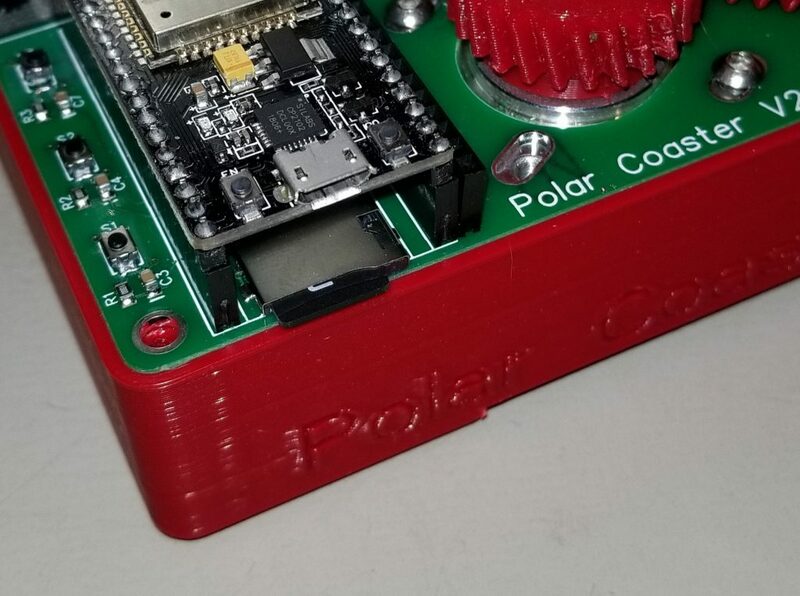 I recently decided to update the Polar Coaster project. The primary reason was to update the controller to use Grbl_ESP32 firmware. I also thought I could make it smaller, lighter and remove a little cost. The old controller was not custom made and just sort of tacked onto the back. This increased the size and didn’t look very good. It had a Bluetooth module, but you still had to stream the gcode. You could use an Android app, but that was still a little awkward. The controller runs Grbl_ESP32. This was recently updated to include pen machine features. This allows precise control and calibration of the pen servo. 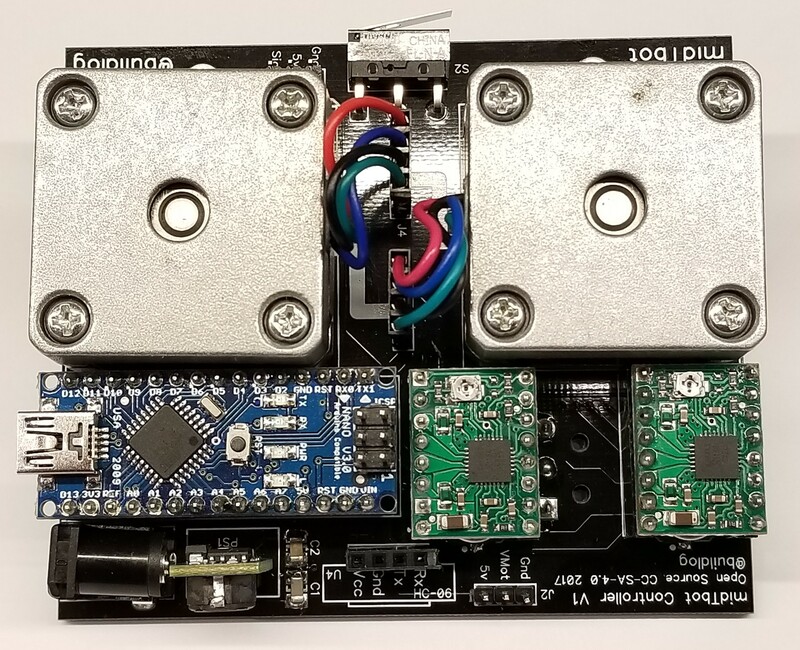 You can control the speed, timing and endpoints of the servo travel. The controller has a web server that serves a web app. This allows complete control of the machine. Web browser based control is ideal, because it is compatible with anything that can use a browser. We hope to add additional web apps for generating gcode from images and SVGs. This is a great feature. If you have files on the SD card, they can easily be plotted. The WebUI lets you upload files and then click play. Both versions use NEMA 14 motors. The original version used 34mm deep motors. I used these because I had some. They are overkill, because there is very little load on the motors. I bought some 20mm deep motors for the new version. These are even a little overkill. I am only running about 0.3A of current into each one. 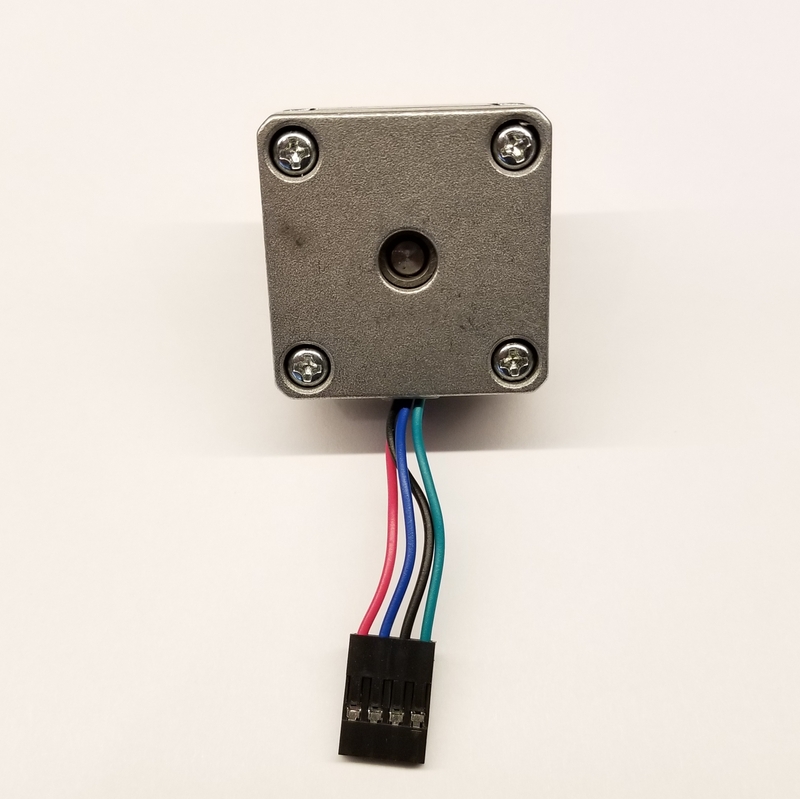 There are not too many options for standard stepper motors that are smaller and lower cost than these. 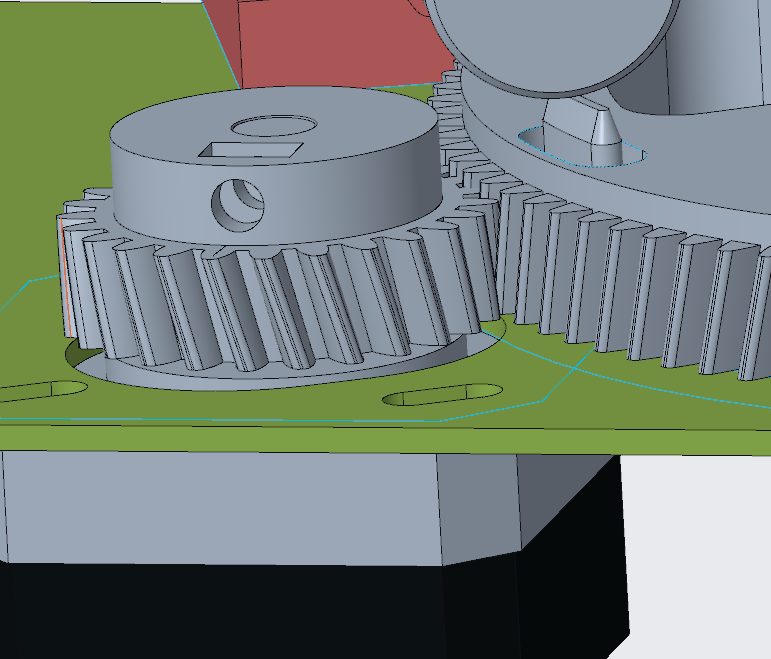 I decided to change from a belt driven rational axis to a gear driven one. Loop belts are a pain, because you have to order them from expensive places like SDP-SI and if you want to tweak anything, you might need to order a different size. I decided to use helix gears this time. These are 15° gears with a modulus of 1. 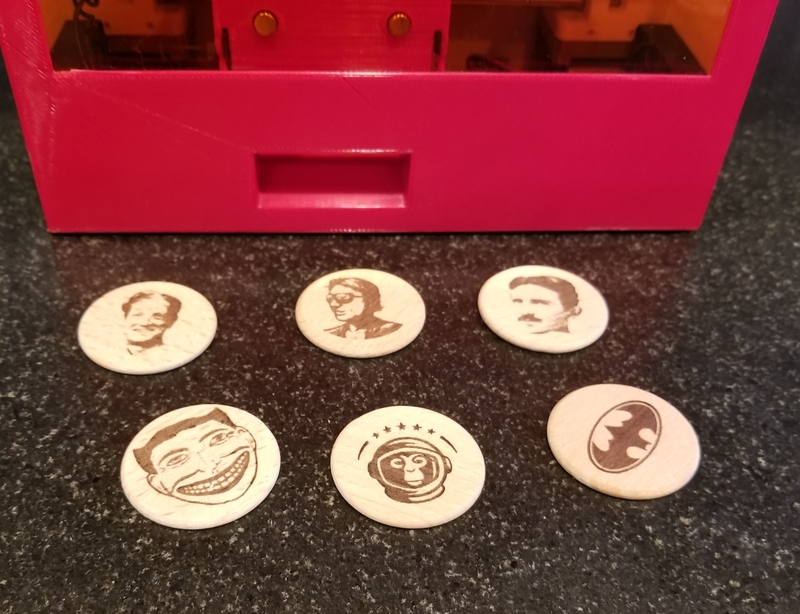 They print and work great with my printer, even on a coarse layer height. The motor is mounted on slots and it is easy to get virtually no backlash. The helix keeps them quiet. The platter rotates around a central bearing. 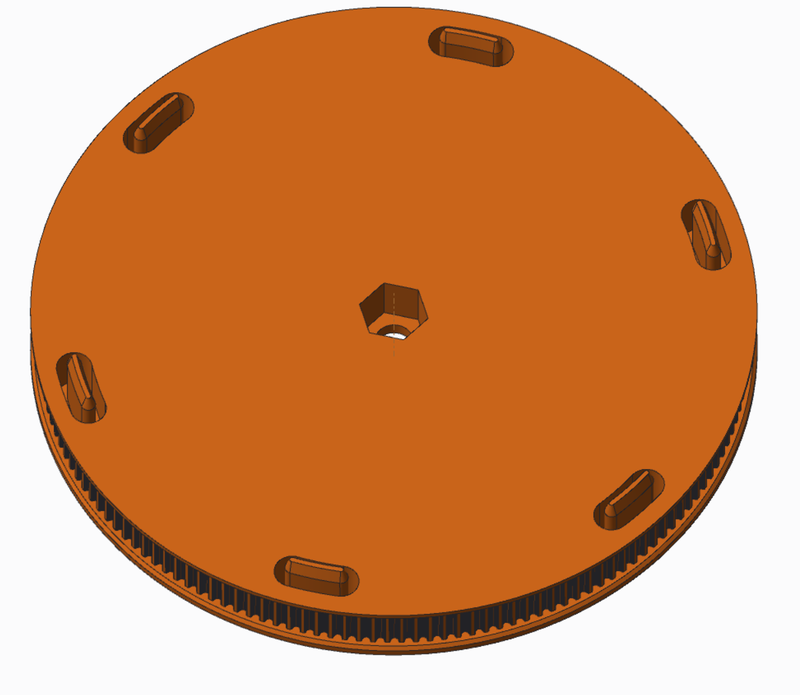 This pulls (3) smaller bearings, that act like wheels, into contact with the PCB. This causes the platter to stay very flat, without wobble. I created a copper ring, plated with solder on the PCB to make it extra smooth and wear resistant. It also looks really cool and shiny on the PCB! Since there was a little room left on he board, I added three buttons. I have not added anything to the firmware yet. I think one will definitely be a homing button. I am not sure what to use the others for. I thought it might be handy to have a repeat button to repeat the last plot without having to fire up the phone app. 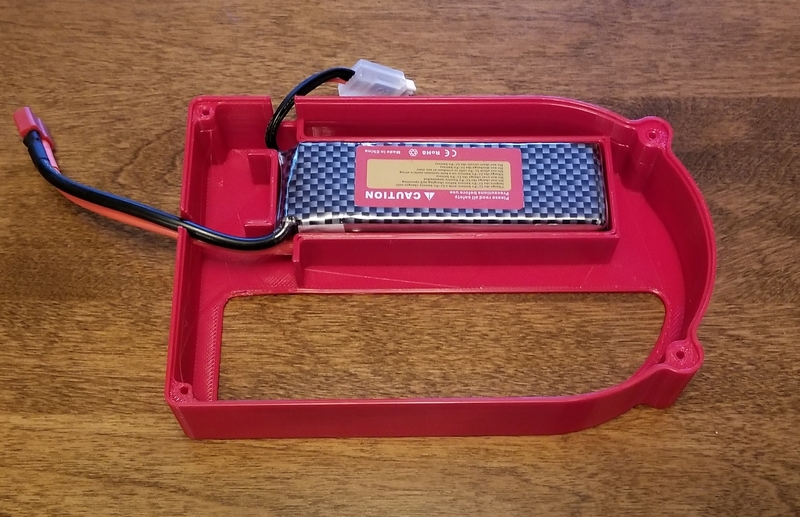 I made a battery case in the base of the machine to hold an RC style LiPo battery. I am using a 3 cell (11.1V) 2200 mah battery. The idle current on the machine with the WiFi running is about 80ma. When plotting it peaks at about 800ma. I think I should get about 2 hours of continuous plotting. Put kinematics into the firmware. currently files need to be pre-processed with the python script. I have done several pen and laser machines lately, so I decided to create a custom PCB for Grbl_ESP32 for these types of machines. This is a small (70mm x 60mm) PCB with all the features a pen plotter or laser cutter/engraver would need. 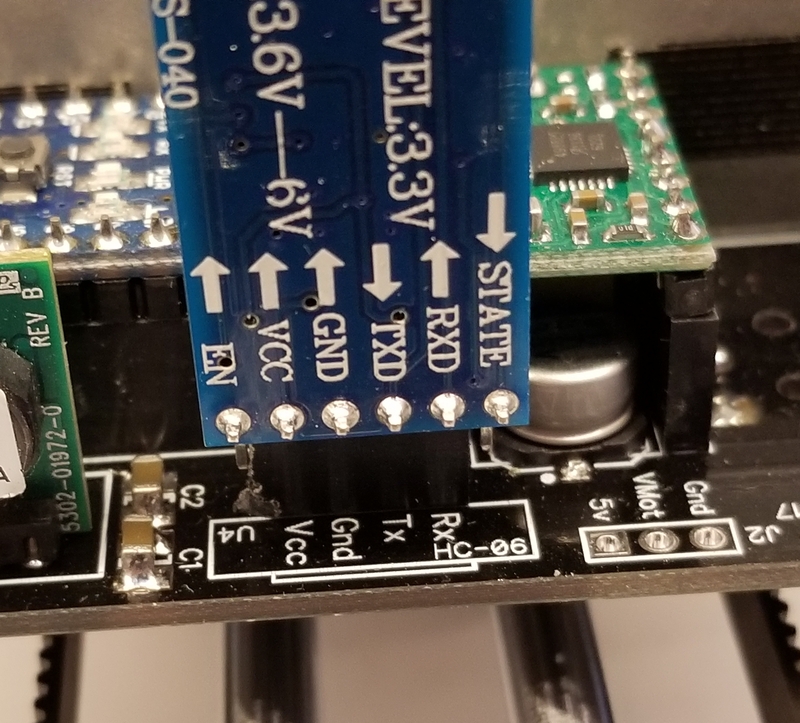 These typically use stepper motors for the X and Y axes. 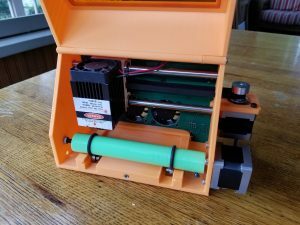 On pen plotters, the Z axis is controlled by a servo or solenoid. On lasers you need an accurate PWM for laser power control. (1) High Current (10A max) Output Control. This can be used for a solenoid, fans, etc. 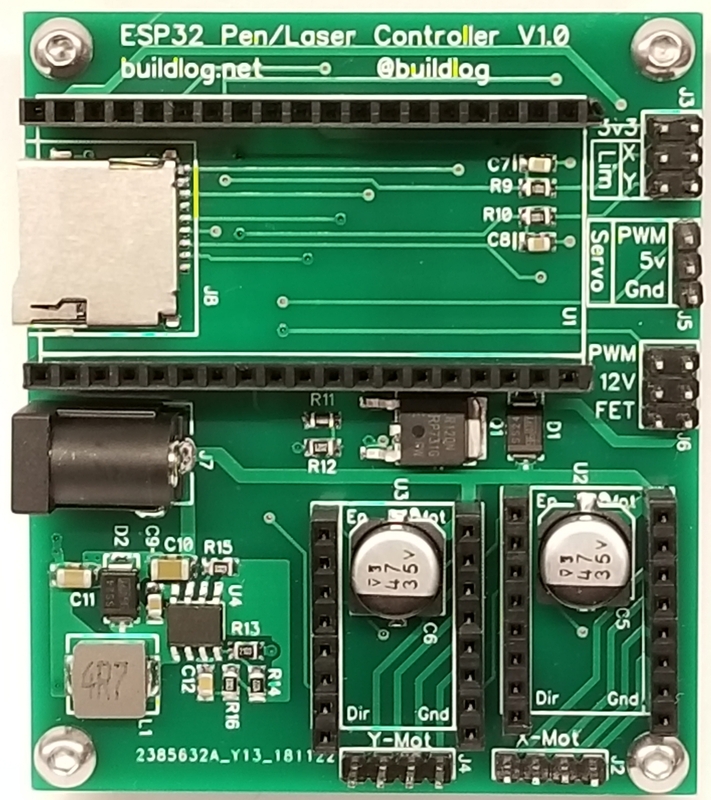 Instant On/Off – Unlike a Raspberry Pi, there is no long boot time or formal shutdown required. It is typically ready to go in a few seconds. 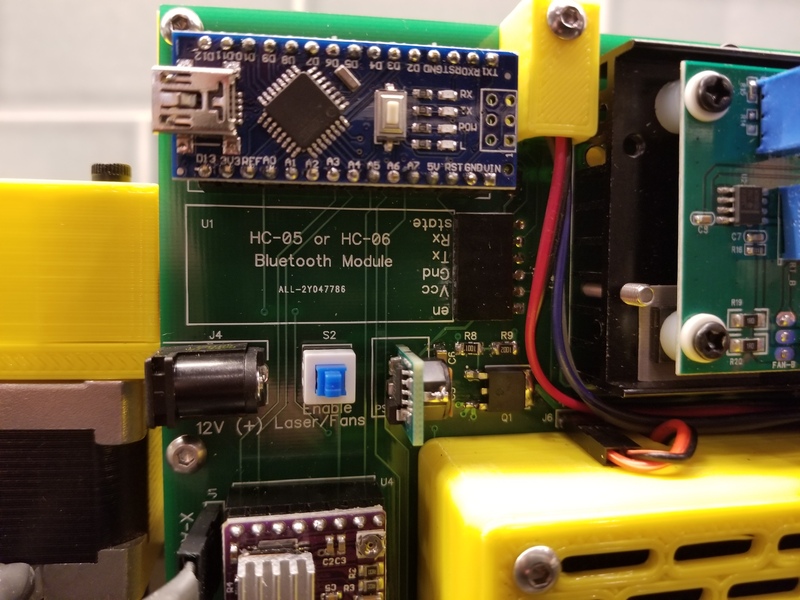 There are several ways to connect to the controller, but to run jobs, you basically either stream the gcode or run it from a file on the SD card. The SD card is a great feature because it is free from connectivity interruptions and you don’t need to stay connected to your machine while it is running the job. You can quickly upload files via WiFi or remove it and plug it into your computer. 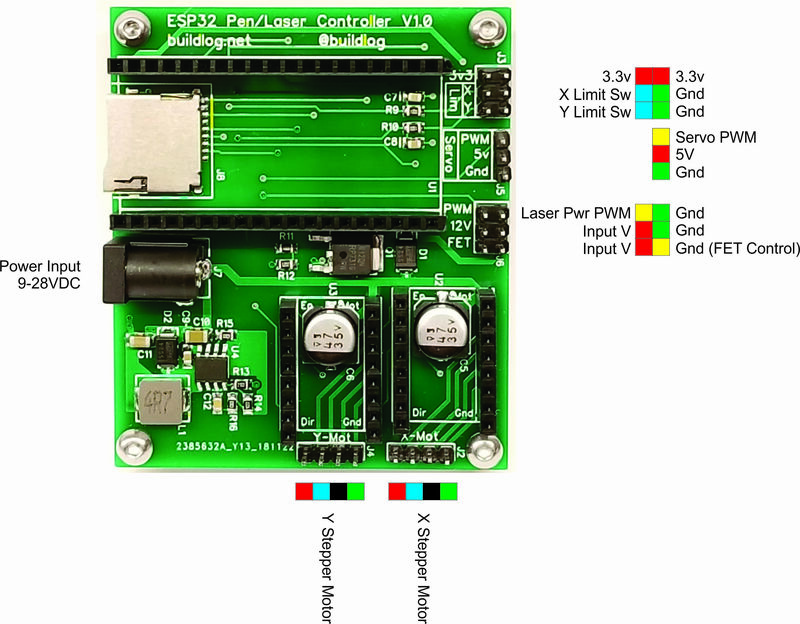 This controller is compatible with virtually all of the serial port gcode senders for Grbl. The default baud rate is 115200. 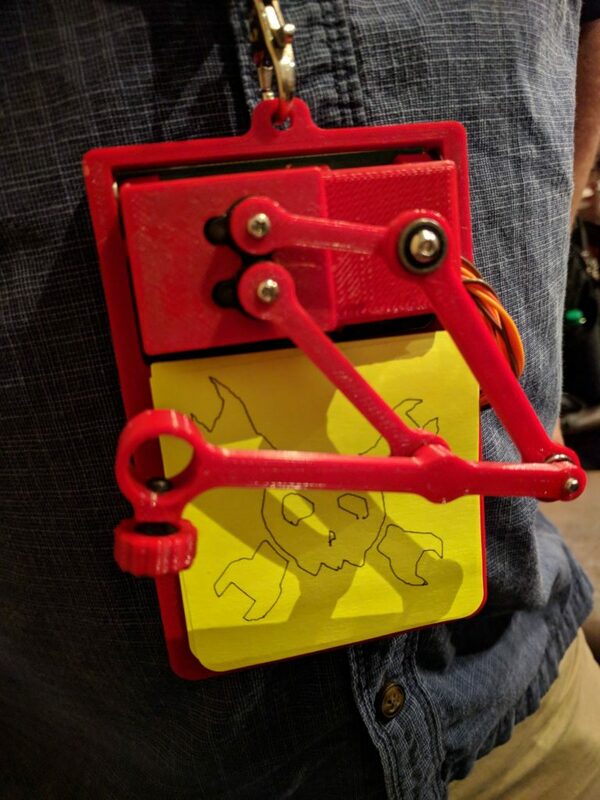 This is a great way to use your phone to control a machine. When you connect via bluetooth, your phone or computer will create a virtual serial port. 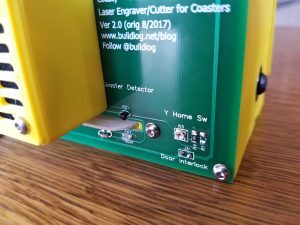 This means you can then use existing serial port based gcode senders. The controller has a web server. The controller can create its own WiFi access point or connect to an existing WiFi network. You connect to the controller with a web browser and it serves a full featured machine controller to browser. 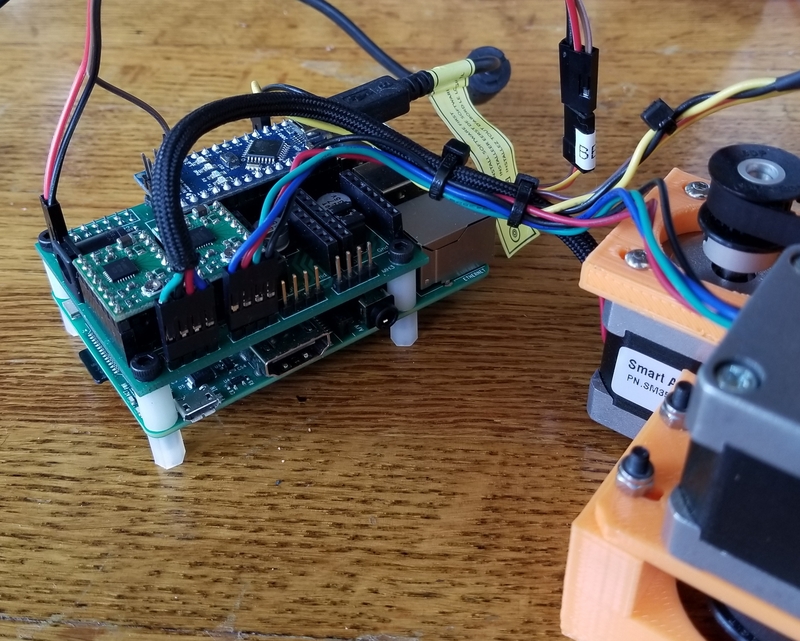 The servo is controlled using a separate RTOS task on the controller. Grbl thinks it is running a normal stepper motor on the Z axis. Each time the servo task runs, it looks at the current position of the Z. It then computes and sets a position for the servo. You map the servo’s range to a Z range. For example the range could be set for 0-5mm. 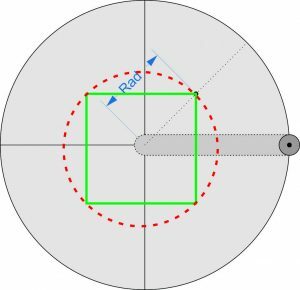 Any values of Z above or below this range would would be limited by the range, so any Z value above 5mm in this example would not move the servo past where it was at 5mm. You can calibrate the end points of the servo to fine tune it. We use the Z axis resolution and max travel settings to do this. $102=100 (100%) would be no change to the first end point. %102=90 or $120=110 would be 10% changes in either direction. $132 works the same way for the other end point. Make sure you do not adjust the servo so it hits the physical end point of its travel. 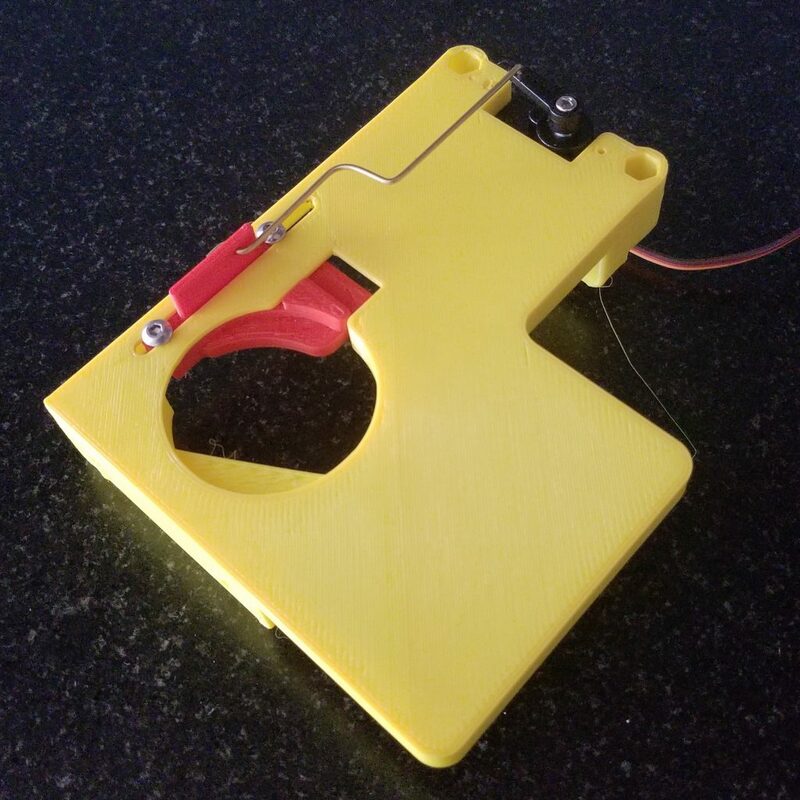 You will feel the servo continuously vibrating as it pushes against the end point. This is very hard on a servo and will overheat and damage it. The servo updates its position 20 times per second. Therefore it will do a good job of respecting the acceleration and speed settings in the gcode. The feature also uses the $1 (Step idle delay) setting. 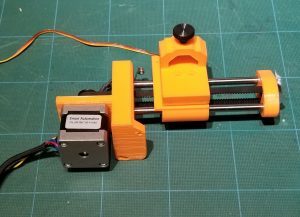 It the steppers motors disable, so will the servo and can be moved manually. The controller uses plug in modules for the the ESP32 controller and the stepper motor drivers. The ESP32 controller needs to be a ESP32 Dev Module. It should have 2 rows of 19 pins. The rows should be spaced 0.9 inch (22.86mm) apart. Be careful: Some similar controllers have a wider pitch. The drivers are the standard StepStick (Pololu) style footprint. The (3) microstepping selection pins (MS1, MS2, MS3) are all connected to logic high. This typically results in the highest resolution (1/16 or 1/32). 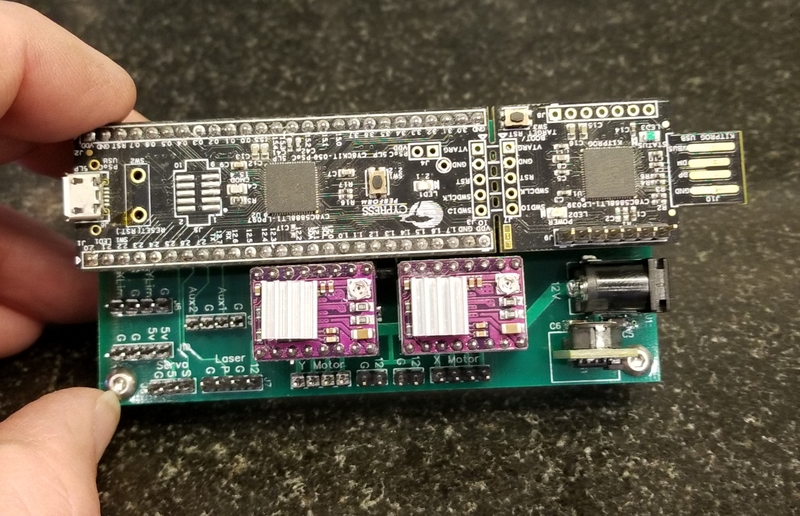 The Grbl_ESP32 step rates are high enough to make that not an issue. 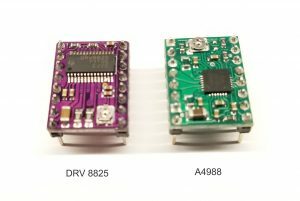 I typically use TI DRV 8825 or Allego A4988 modules, but others can be used as long as the pins are compatible. 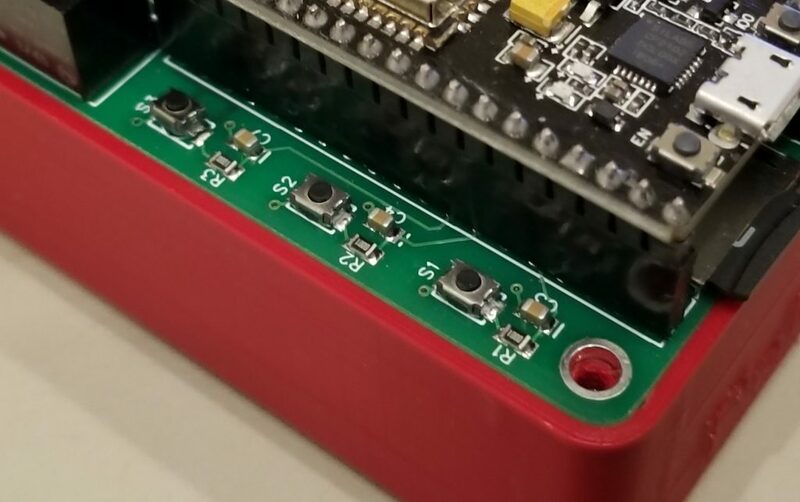 The PCB silkscreen has the corner pins labeled. Use them to insure you correctly install your driver modules. 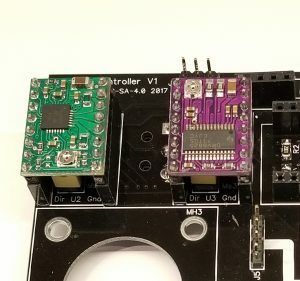 A completely assembled PCB is available on Tindie. 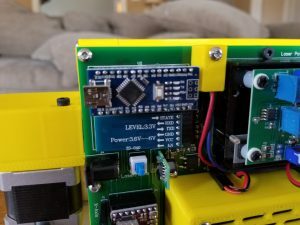 The profits from Tindie help me to continue to develop the hardware and firmware for projects like this. If you want to roll your own, the source files are linked below. If you have any suggestions or need a custom design please contact me. 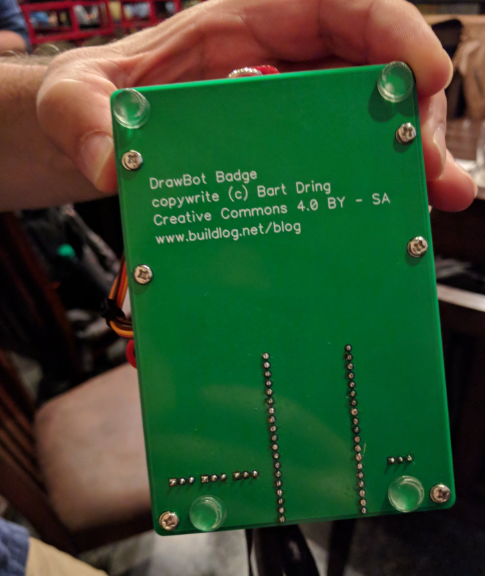 I showed off an early version of my DrawBot Badge at the Hardware Happy Hour last night. Some tweeted pictures generated a lot of questions, so I thought I would write a quick post about it. 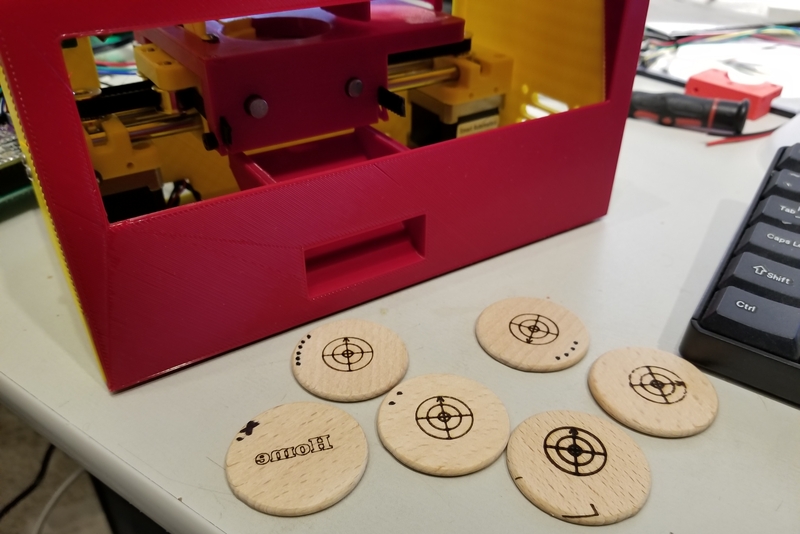 I have been following the #badgelife thing for a few years and felt that the mechanical and CNC world needed to be represented. The goal was to create something small, safe, fun and something anyone could learn to use. A drawing machine seemed the perfect fit. 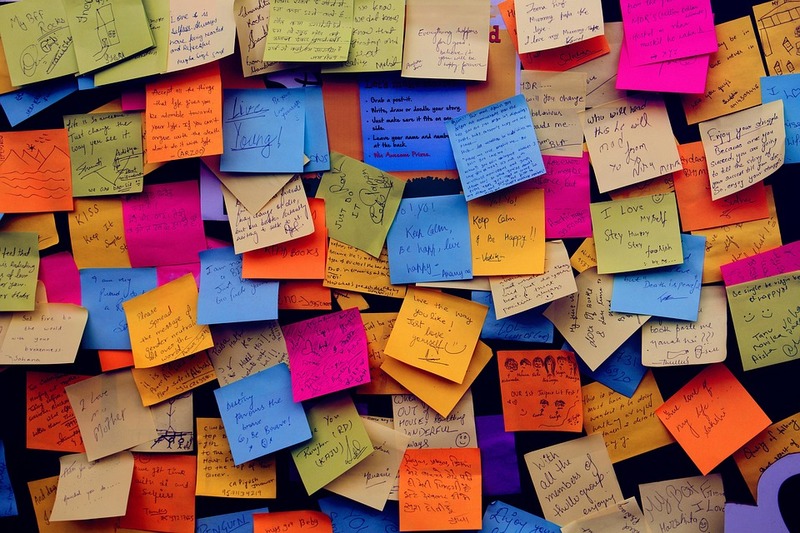 I decided to use 3″ square Post-It notes. The main feature is that they are self stick, so I don’t need any clamps or tape. It is also cool that you can stick them to things when the drawing is done. They are cheap and easy to find. I like the kind that have the majority of the back (full stick) covered in adhesive. This means you can use a small stack of them and peel them off as they are done. I tried to make the drawing mechanism as tiny as possible. The size is about 30mm x 70mm. It uses (3) of the smallest readily available class of hobby servos call micro servos. You can buy these from AliExpress for as low $1-$2 in low quantities. The choice of the arm configurations was primarily based on tightly packing the the motors, but I also wanted something new and interesting. The pen lift is simply a cam on one of the motors. The entire mechanism rotates on two 3mm bearings. In my experience with drawing machines, gravity is the best way to engage the pen to the work. The mechanism needed to work hanging from a lanyard or sitting on a table. There is only one electronic item right now. 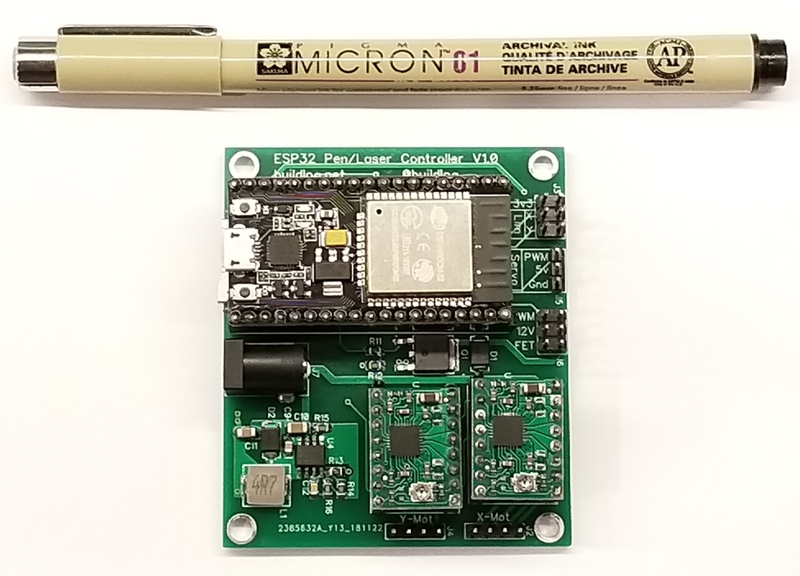 It is an ESP32 dev module. There are also (3) connectors for the servos and (1) for voltage monitoring. The entire back of the badge is a PCB. I made the board full size to enclose the back and the pen lift cam need to push on something. I have big plans for the rest of the area though. 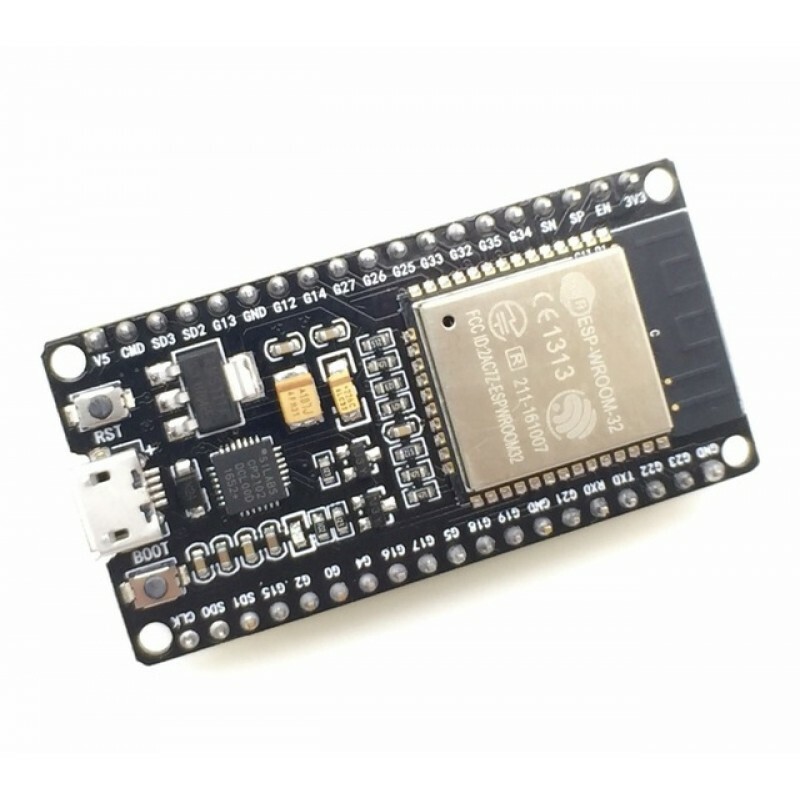 The ESP32 provides the Bluetooth and Wifi needed for the remote control. It is running my ESP32 port of Grbl with a little hacking for the servos. The ESP32 uses an RTOS, so I just created a low priority, repeating task (20Hz). 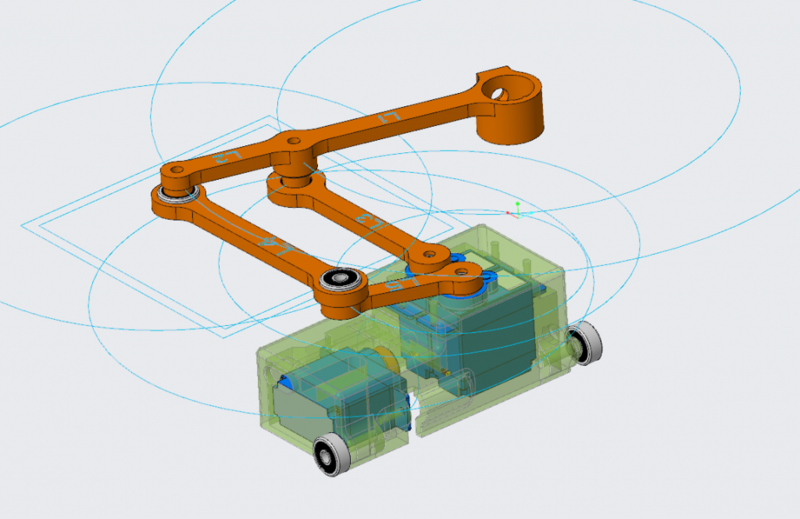 The task checks the position of a virtual CNC machine, does some kinematic math and updates the servos. The software supports streaming drawing data (gcode) via serial port, bluetooth, SD card or wifi. I am using the bluetooth option to send via my phone. I will publish the firmware soon. The math is actually not too hard. You know the desired pen location, the axes of the servos and the lengths of the linkages. There are two ways to do the math. The first way is using the law of cosines and the Pythagorean theorem. The second method uses intersecting circles. 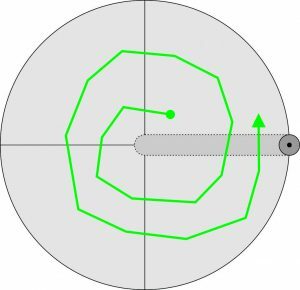 Each linkage can sweep a circle from a axis point and radius. Any two linkage’s circles will intersect at two points. It is easy to pick one of the points as more desirable. While it is less deterministic, due to the two points thing, it appears to run about 40% faster on the ESP32. The Z is very simple. Any Z value less than 0 is pen down and everything else is pen up. The quality is basically “Adorably Wiggly”. 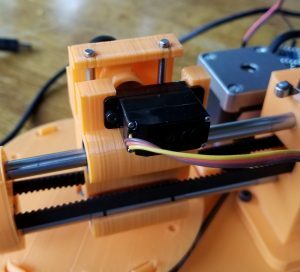 I am using the cheapest analog servos. That means I might get about 200 x 200 resolution at best at the servo hubs. If you mapped that grid to the paper it would be a warped grid with dense and sparse areas of the grid due to the non-linear nature of the mechanism. Digital servos with very low deadbands (~1us) it would probably do a lot better, but I am not sure that is worth it. It would only be a little less wiggly. 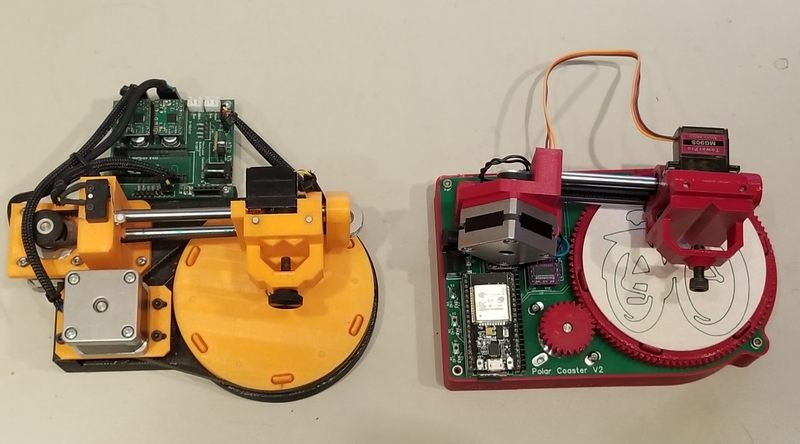 They cost about 4x what analog servos do (still pretty cheap). There is a calibration feature. 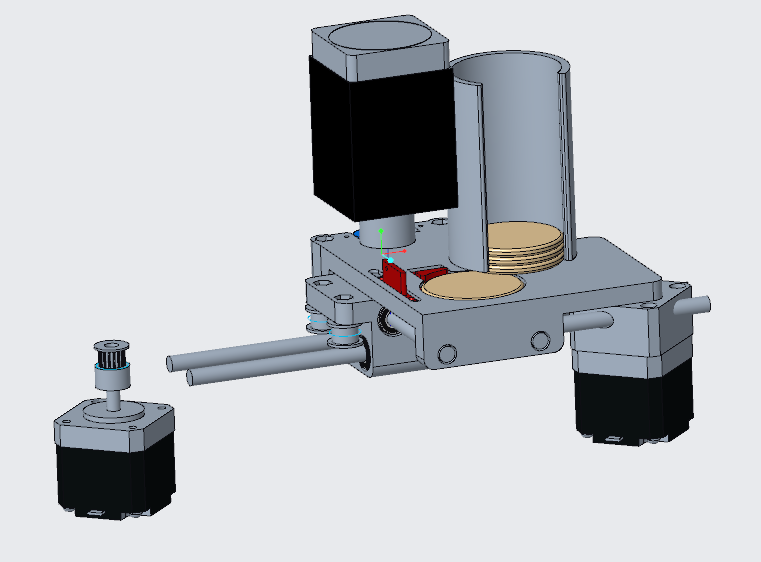 Each servo is a little different and it is difficult to precisely mount the arms at the right angle. The calibration adjusts the zero angle and pwm/degree of rotation. 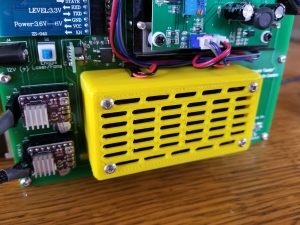 This project is part of a talk proposal for Hackaday SuperCon 2018. If that gets accepted, the badge will become a full featured CNC controller capable of running a router, laser cutters, high res plotter, etc, as well as the Drawbot badge. 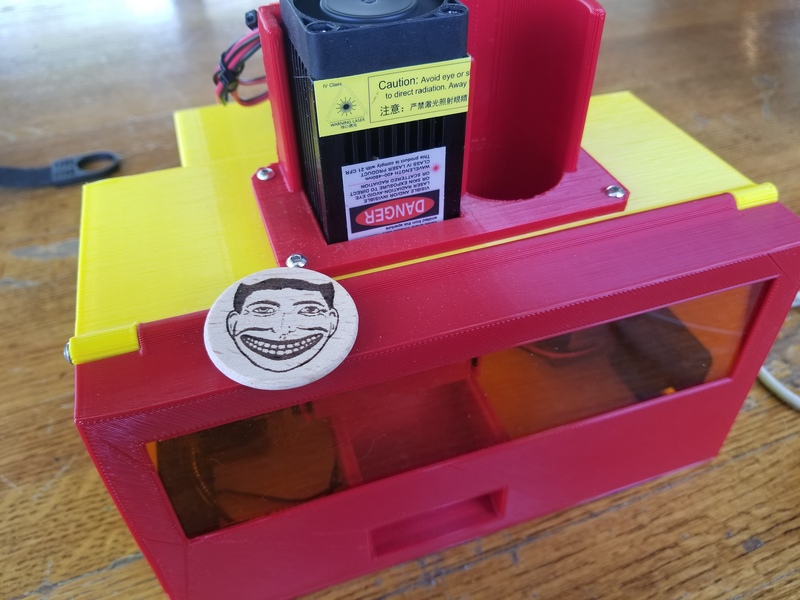 Only the DrawBot will be populated. The rest will be modular like this board. Regardless of what happens all source files will be publish sometime in October. Follow me on Twitter (@buildlog) or subscribe to this blog if you want to follow the project. 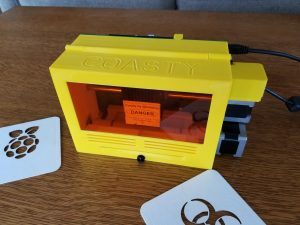 Here are some updates to Coasty – The Coaster Toaster, the tiny laser cutter specifically designed to cut drink coasters. I made the traction roller diameter a lot smaller and moved it behind the beam. A smaller roller has a lot of advantages. It allows the beam to be closer to the contact points of the rubber orings. This improves the usable work area, because you can get closer to the edge of the coaster. With a smaller diameter the coaster travels less per revolution. This increases the torque and resolution. 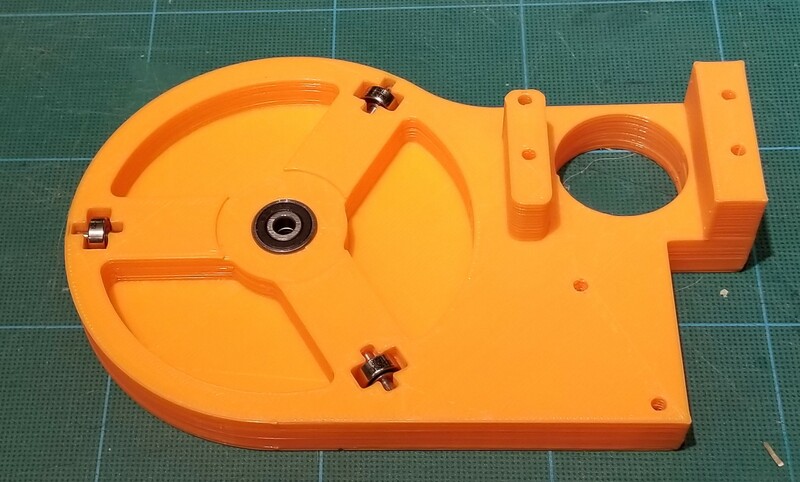 The chassis is now about 16mm smaller in depth due to the smaller roller and new location. The depth of the machine is quite a bit smaller than the coaster. I added a fan cover on the back. 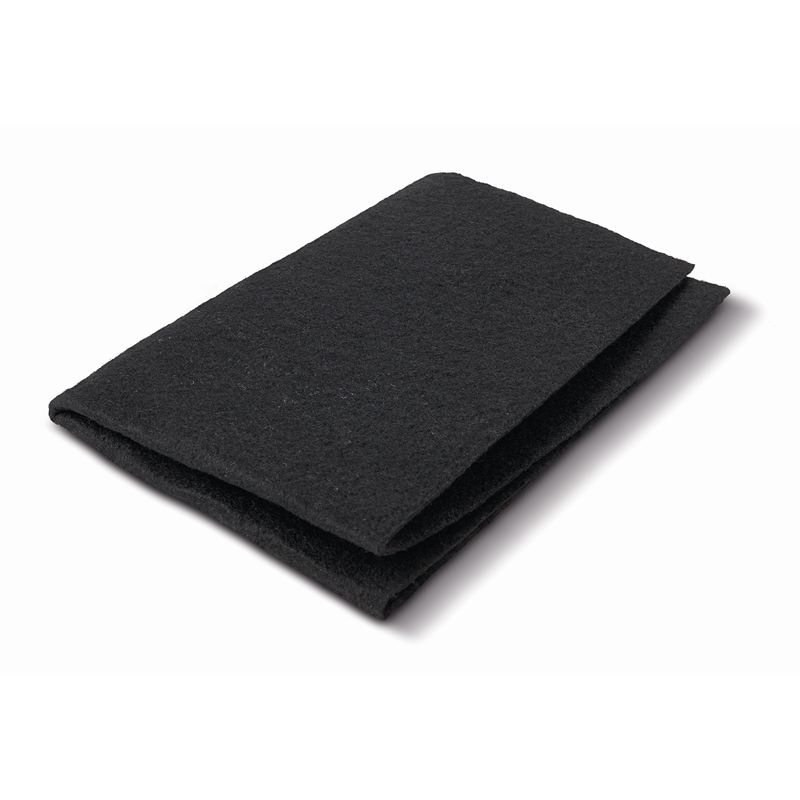 This acts as a finger guard and also allows a few layers of carbon filter cloth to be used. Bulk carbon filter cloth for use in air purifiers can be purchased on Amazon very cheaply. It removes a good portion of the odor of the smoke. There is now a switch that cuts all power to the laser when the door is opened. You can still run the machine to test the motors, homing etc, the the beam cannot turn on with the door open. I was not happy with the coaster homing switch used on the first version. While it never failed, it did not appear to be very robust and it caused some drag on the coaster. I changed to a IR LED and photo diode. When the light from the LED hits the photo diode, it conducts to the +5V. When the coaster blocks the light, it is pulled down to ground. I used a pot on the pull down because it did not know what he exact value would be. It turns out the value needs to be about 40k. 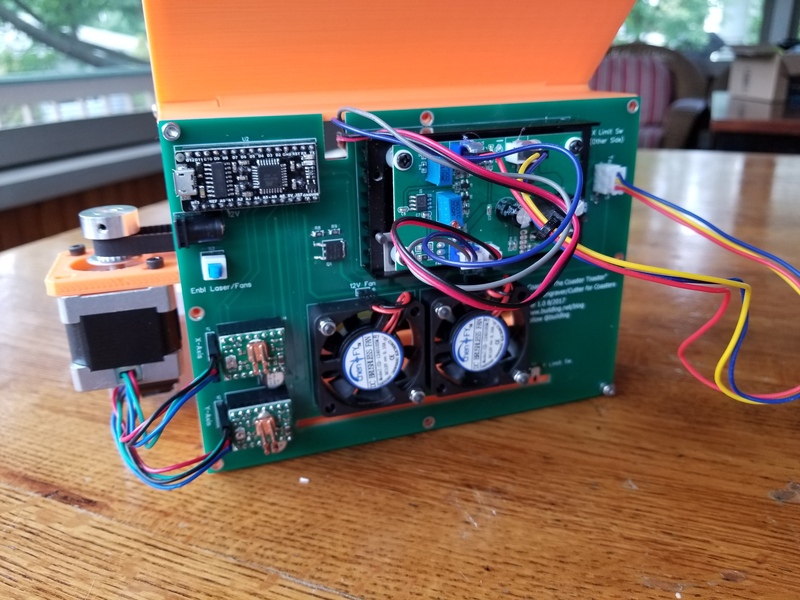 The only catch was the microcontroller input pin pull up resistor on the Nano could not not used because it is less than the 40k. This required a slight hack to Grbl because Grbl is all or nothing on the pull ups for the limit switches. I was not sure if ambient light changes might be a problem, like bright sunlight. The photo diode looks down and that appears to be good enough to avoid overhead light. I also have a mounting screw there in case I need to add a little shade/cover. I have been using Bluetooth on some other machines and really like it. Skipping USB cords and using a phone instead of a computer is great. I have found it to be very reliable. The real world bandwidth appears to be a little lower than 115200 USB. It has not been a problem, but I don’t do much gray scale engraving on this machine which needs higher bandwidth. Regardless, USB is still an option. A standard HC-05 or HC-06 module plugs into a right angle connector. Here is a video of this version. 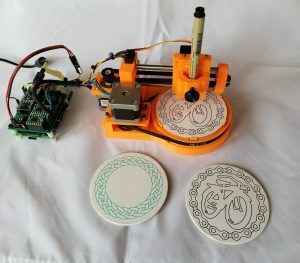 The midTbot Controller is a controller for midTbot pen drawing machines. It is sold on my Tindie store. When fully populated, it has the following features. Bluetooth connector for HC-05 or HC-06 module. 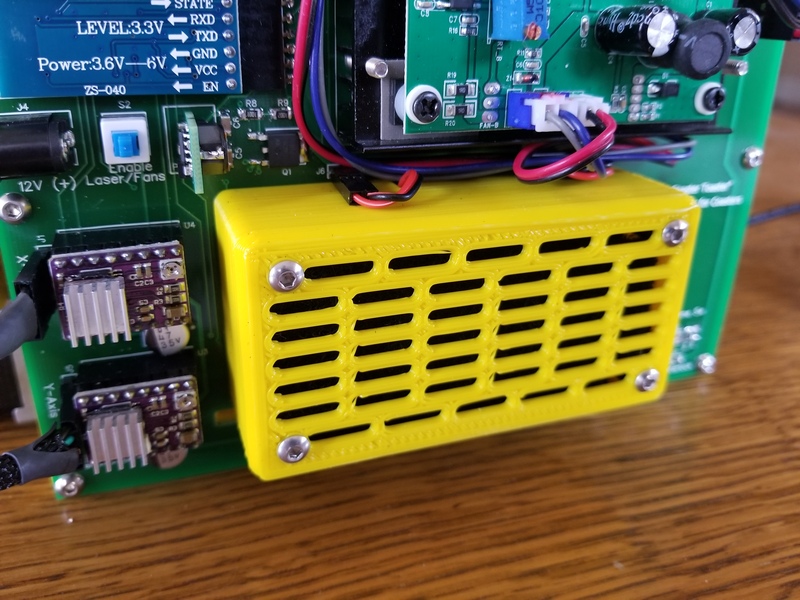 Aux power connector for easy access to 5V and 12V power. 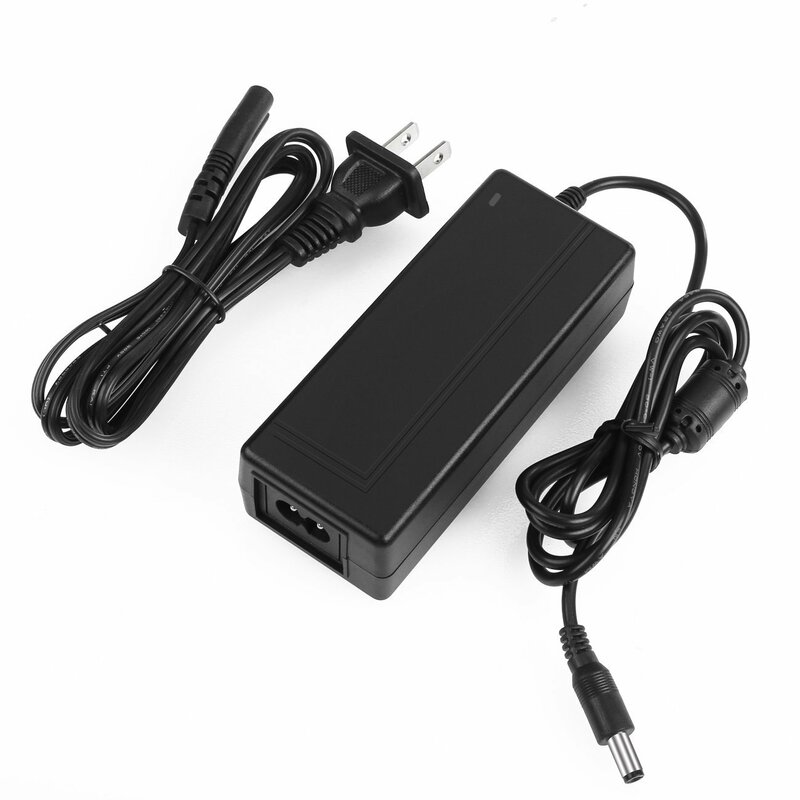 You will need a 12V DC power supply with at least 3A of power. 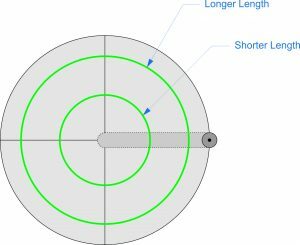 The DC plug should be a coaxial 5.5mm x 2.1mm type with center positive. This type of plug is the most common type and should be pretty easy to find. 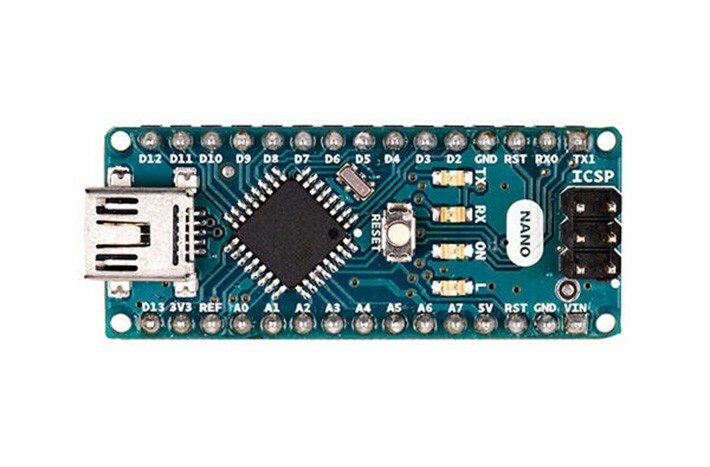 You should use an Arduino Nano compatible controller. The controller bootloader will need to be changed to the smaller Arduino UNO bootloader in order to fit the firmware. I have instructions on how to do this here. If you would like to buy one already modified, I sell them on my Tindie store. Be sure to install the controller in the correct orientation. The USB connector should face the edge of the controller as noted on the silkscreen of the controller PCB. 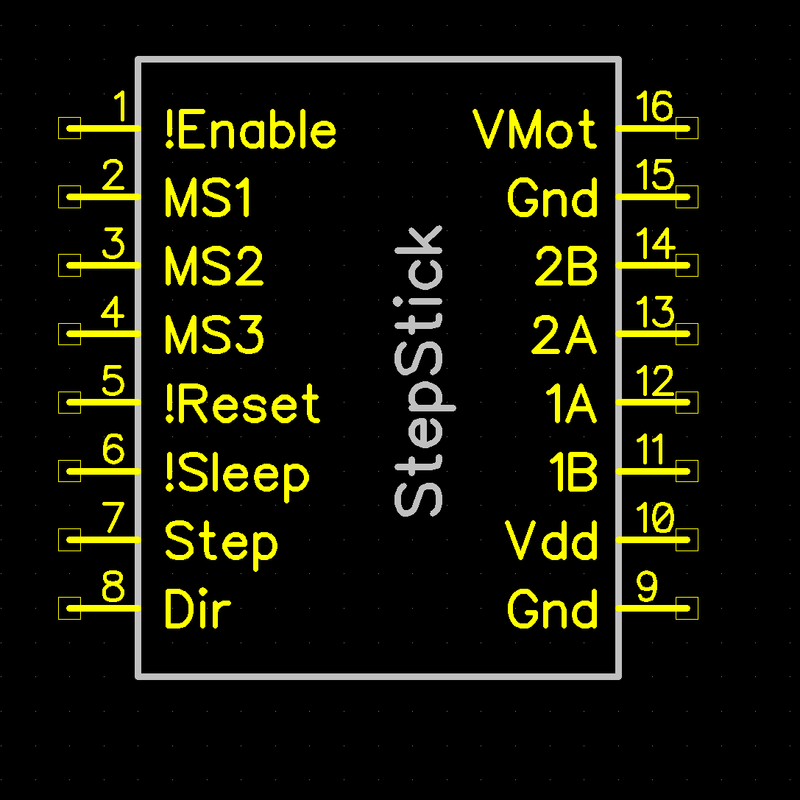 You will need 2 stepper driver modules. I recommend ones based on the Allegro A4988 controller or the TI DRV 8825 controller. The drivers often come with heatsinks. The current will typically be set low enough that heatsinks are not needed. Note the MS1, MS2 & MS3 labels next to the jumpers. The orientation of the drivers is very important. You will break the drivers and likely other parts if you insert them wrong. 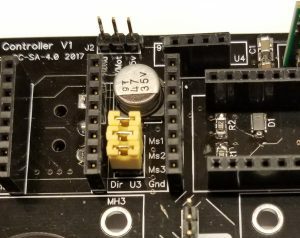 Most drivers have the pins labeled and the the controller PCB has the corner pins labeled. Be sure the labels match. 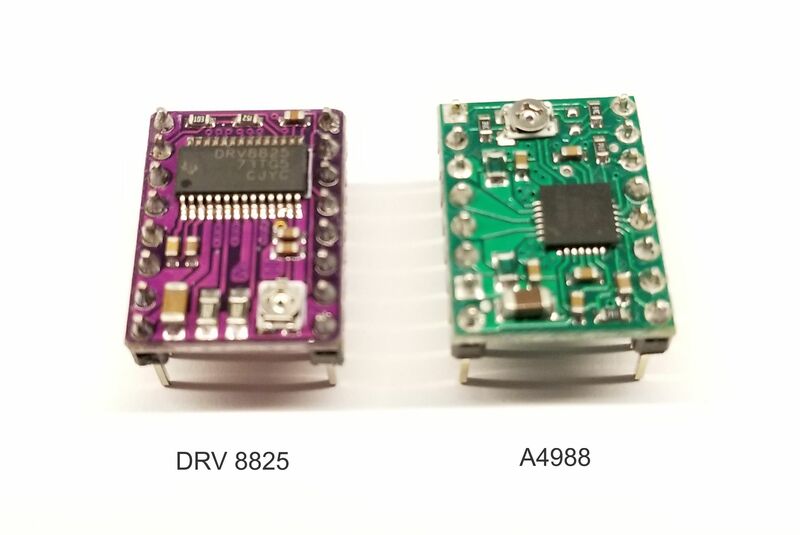 Here are the correct orientations for the A4988 and DRV8825. 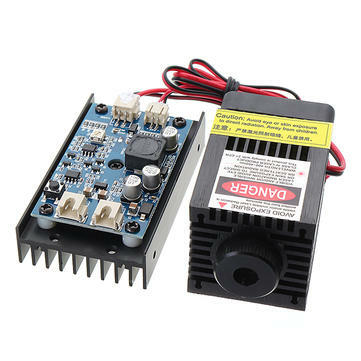 You should set the stepper driver output current to the level required by your stepper motors. 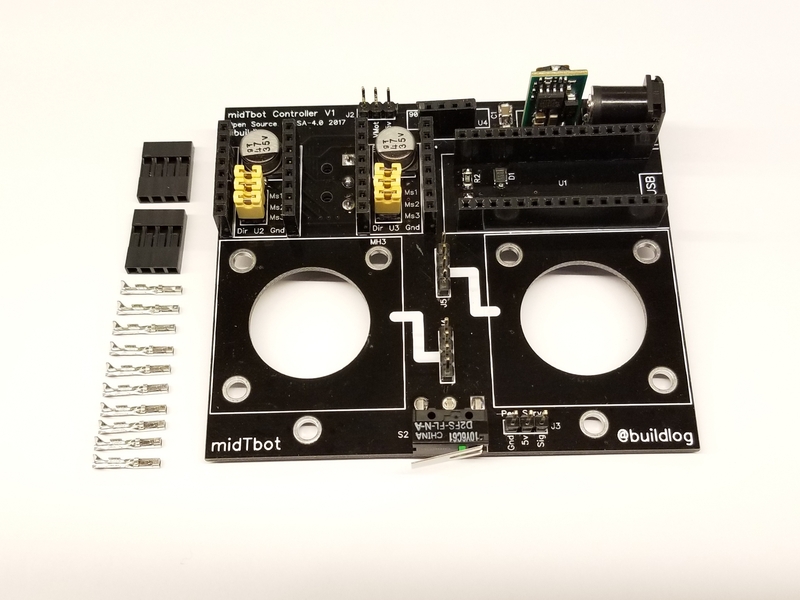 The midTbot does not need a lot of power. 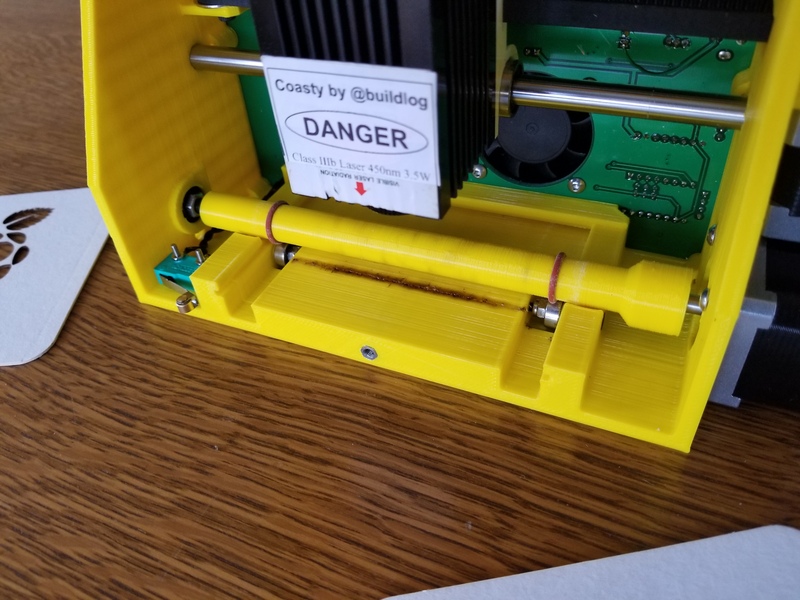 If you set the power too high, the motor could get hot and damage the 3D printed part it mounts to. 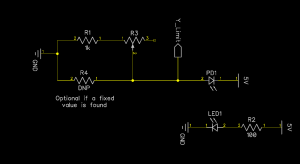 You set the current by adjusting a potentiometer and reading a voltage. The drivers need to be powered when you do this. You can install them and power the board to do this. Do not connect the motors when adjusting the potentiometer. Each driver will have a small hole with exposed metal. This is the measurement point. 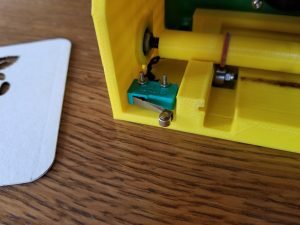 The metal adjustment screw of the potentiometer is also a place you can measure. 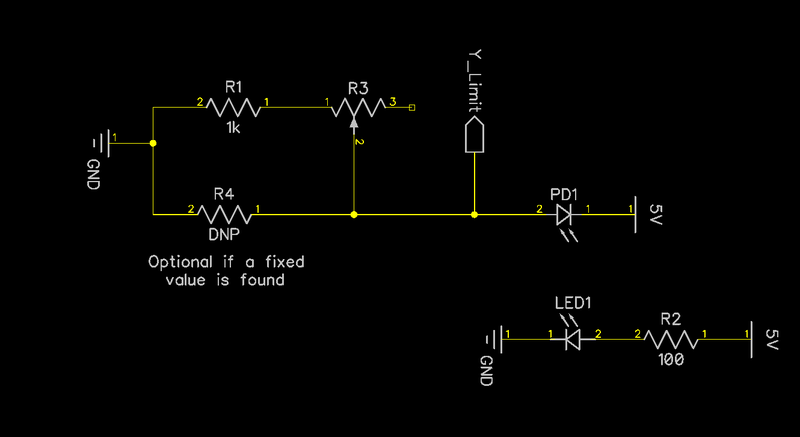 The reference voltage to current formulea are here. A4988 is a little more complicated because there are different versions. See this page. The controller is designed for NEMA14 motors. Be sure to get 4 wire motors. Just about any size should work, but I prefer to use smaller ones to keep the size and weight down. You will need to attach connectors to them. Trim the wires to the correct length so they reach the board connectors when installed. Wires colors should be installed as shown. 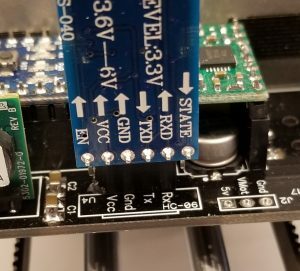 The wiring legend on the board that shows where to plug in the motors might not be right. It depends on the way the motor manufacturer wired the coils and which stepper drivers you use. You may need to swap them or rotate the connectors 180° if your axes are moving the wrong way. Here is a photo of how mine are wired. Try this first. Note the wire colors and which motor goes to which connector. You can add an HC-05 or HC-06 Bluetooth module. They have different connectors, but just match the pin names on both sides. You will need to setup the module to have a baud rate of 115200, N,8,1. I have detail on how to do that here (HC-05, HC-06). 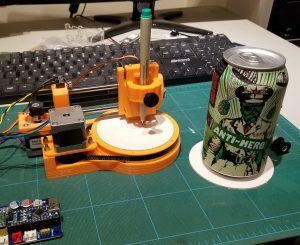 I designed this machine to draw custom, round drink coasters. I already have a laser cutter for square coasters and I wanted to try something unique for round coaster. The base of the machine has two stacked 5mm bearings in the center for the bed to rotate on. There are (3) 3mm bearings on the bed perimeter that provide support and keep it level. They have little shafts that snap into the base. The bed is a 156 tooth GT2 pulley. It has little springy fingers that grip the coaster when it is on the bed. The bed connects to the motor pulley with a closed loop belt. 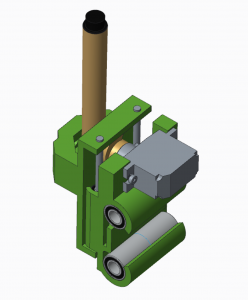 This is a belt driven, cantilevered arm that uses 6mm shafts and linear bearings. The belt is a cut pieces with the ends clamped at the carriage. 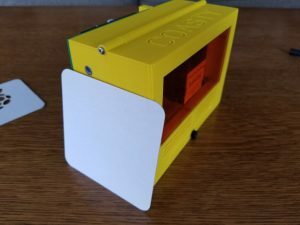 It has a slotted mounting hole that lets the arm rotate. 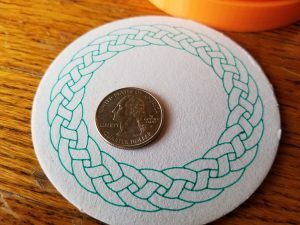 The pen must be adjustable to get to the exact center of the coaster or the drawing will be distorted. There is a limit switch on the top. This is the only axis that needs to be homed. To setup the machine you home it and jog the pen until it is exactly over the center of the bed. You then set the work zero for X (Gcode: “G10 L20 P0 X0”). This only needs to be done once. If you use different types of pens, the center should be rechecked. 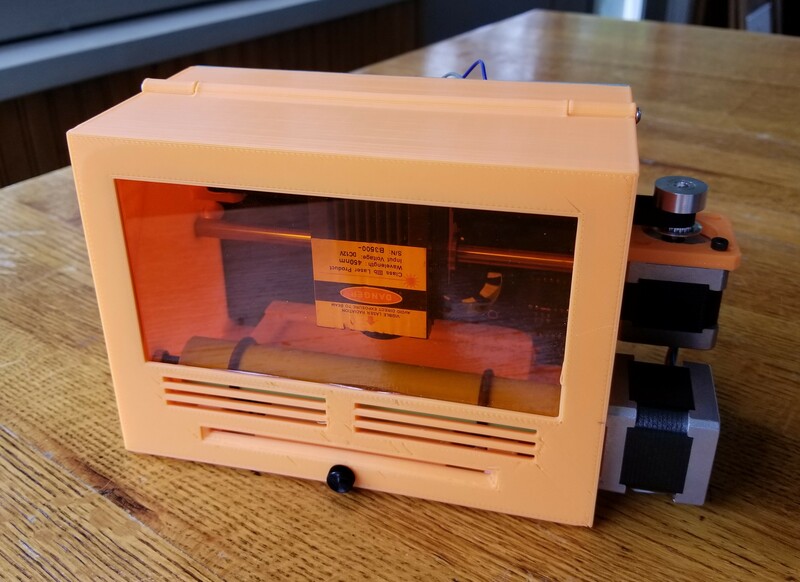 The Z axis uses a micro servo and a cam to control the height of the pen. The firmware is setup to only have (2) Z positions, pen up and pen down. It uses 3mm rods and tiny little 3mm linear bearings. There is a compression spring on one of the rods that applies a little pressure to the pen, and allows the pen to float a little on uneven coasters. I used my Grbl HAT controller. It is a bit overkill for this project but works perfectly. It is attached to a Raspberry Pi in this photo, but I have not been using the Pi in this project yet. I just connect directly via USB. See this blog post on how it was done. The pre-processor is written in C#, but it is rather simple and you could probably read the source file and convert if you cannot deal with C# on Windows. I use a modified version of Grbl 1.1f. Grbl does not support servos, so I needed to hack that in. I used the PWM that is normally used for the spindle speed to control the servo. I turned off the variable speed spindle option and streamlined the spindle functions to the bare minimum I thought Grbl needed. I adjusted the PWM parameters for use with a servo and added pen_up() and pen_down() functions. I tried to put as much of the custom code into one file spindle_control.c. I had to add a few lines in stepper.c to look at the current machine Z height and apply the correct pen up/down function. You can use anything to generate the gcode that works with Grbl. The pen will go up when the Z is above zero and down when it is below zero. Therefore, you want the Z movement as short as possible to speed up the drawing and not have the pen dwell on the material and bleed. I make the depth of cut 1mm and the z clearance 3mm. The design was done using PTC CREO 3.0. A STEP version of the design is linked at the end of the post. It does a great job. Here a recent coaster. 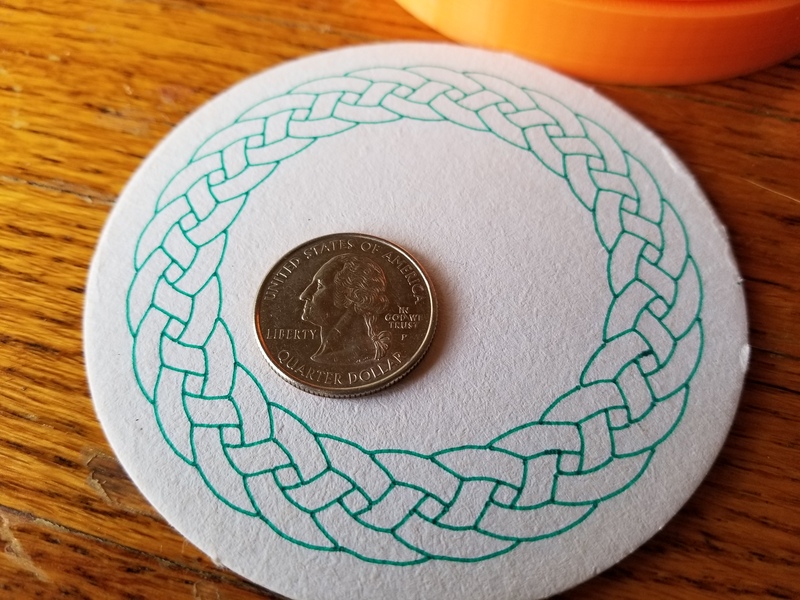 This was done from a rasterized bitmap image found online (searched: circular Celtic braid). Here is a Fat Tire beer themed coaster. Coasters are made to be super absorbent, so larger tipped felt pens tend to bleed a little too much. I like to sketch with Micron pens and the thinner ones really work well on this machine. The build is not difficult, but covers a lot of areas. You should know how to work with STEP files and compile firmware. The design is open source with no commercial restrictions, so feel free to use any part of my work. I found most of the parts on Amazon and eBay. I bought the belt from Stock Drive Products. The polar motor pulley is 36 tooth and the arm pulley is 20 tooth. Cutting the shafts requires an abrasive cutoff wheel. Please post any questions in the comments section and I will try to address them. See the files on Thingiverse. When you have a round work piece like a drink coaster, it makes sense to have a round work area. 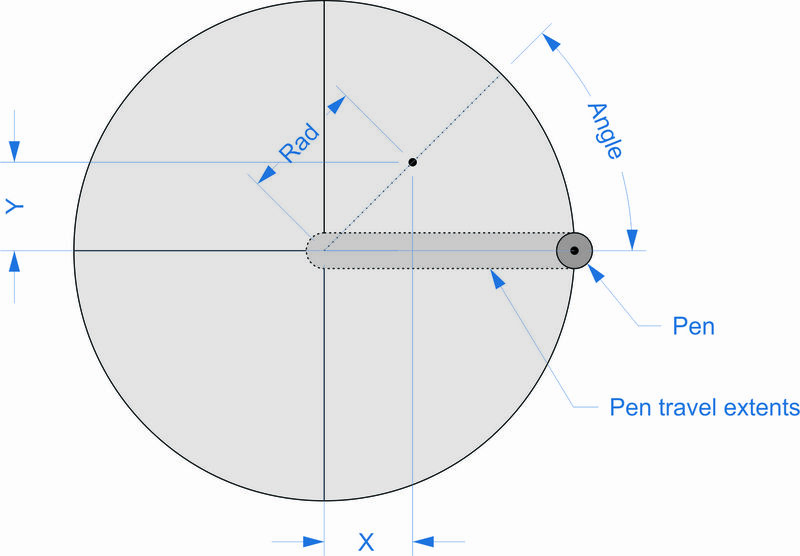 A round work area works best with a polar coordinate system. 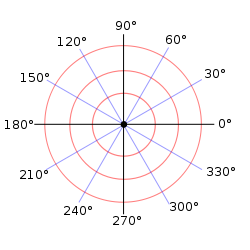 A polar coordinate system uses an angle and a distance from a center point to define a point in 2D. The problem is that most drawing and CAM programs work in Cartesian (X,Y,Z) coordinate systems. My machine controller firmware, Grbl, also works in normal linear X,Y, and Z. The process of converting one system to another uses Kinematics. The firmware is side is actually quite easy. I defined the X axis as the distance in mm from the center (the radius). The Y axis will control the angle. The Y axis is setup so that millimeters will equal degrees. If I tell the Y to move 360mm, it will actually rotate the work area by 360°. I could have used radians, but my brain works a lot slower in radians. 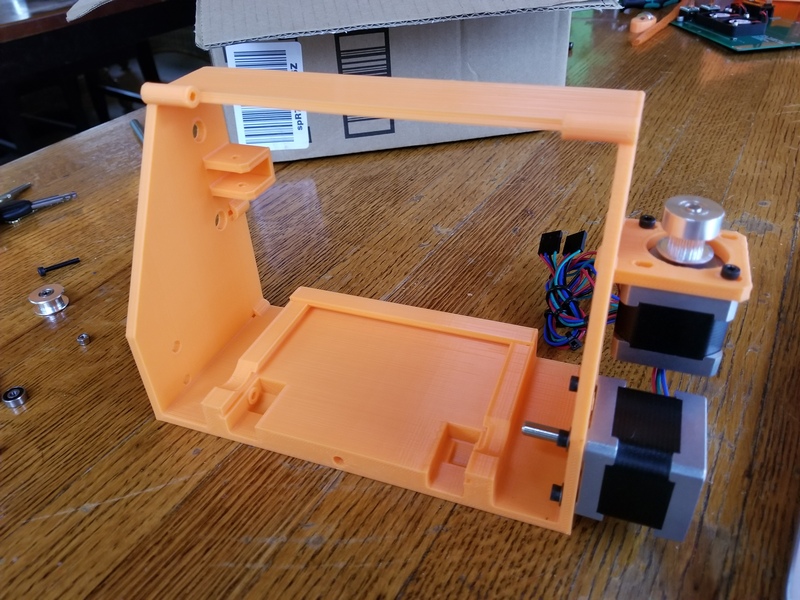 The machine will only need to home on the X axis. It needs to know where the exact center of the work area is. The starting angle does not matter because the coaster is a circle. The conversion from X, Y to polar is probably won’t fit in into the firmware, so the X, Y conversion is done in a preprocessor software program. The X,Y gcode is output from normal CAM programs, then run through a conversion program. 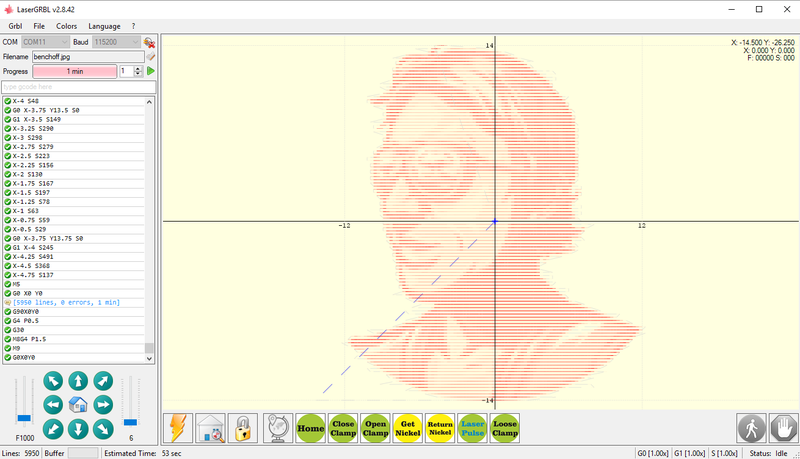 The program reads the X,Y gcode, converts any X or Y coordinates into polar coordinates and outputs a new gcode file. The sender simply sends the new files. 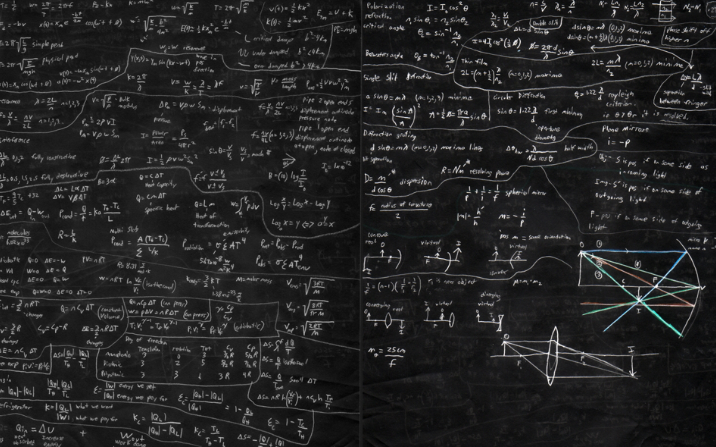 The math is actually quite simple. 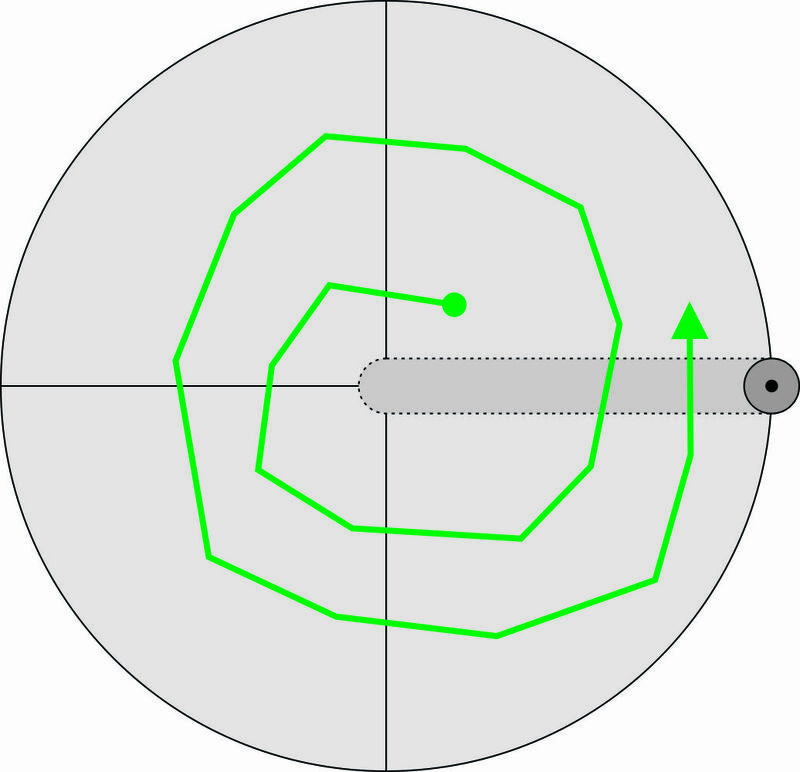 Typical Gcode sends line data by giving the end points of lines. You simply draw from one point to the next, unfortunately this creates a few problems with a non linear machine. If we were trying to draw the green square centered on the work area, the generated gcode would basically send the corner points. Each corner point has an equal radius to the center. 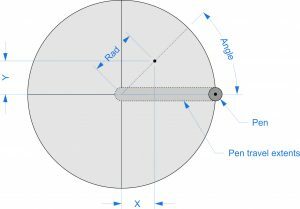 Therefore, the pen will never change radius when going to the next point. This will result in a circle. We want the green square, but we get the red circle. We need to calculate each point along the way to stay on the desired path. The preprocessor divides the line into tiny segments. Each segment has the same problem, but at a scale you won’t be able to see. If we are drawing a shape that crosses the 0° angle we don’t want the angle to spin the wrong way. If a point is at 350° and the next point is 10° (crosses over 0) we don’t want it to spin backwards from 350° to 10°. We want it to go to 370°. It happens anywhere the angle difference between 2 points is greater than 180°. The program will choose the shortest direction even if that means going above 360° or below 0° degrees. 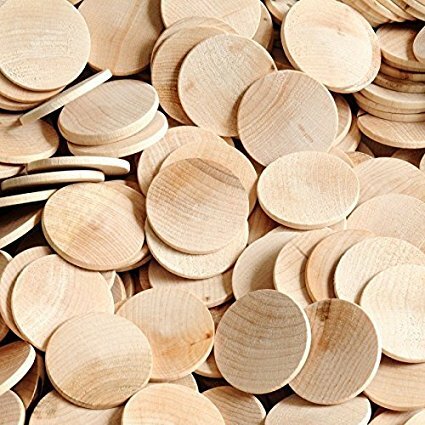 Feed rate, in CNC terms, is the speed of the tool across the material. The CAM software is setting the feed rate as if this were a Cartesian machine. On this machine, if you were drawing a circle, you would simply move 360 units in Y. Without compensating feed rate, the pen would move across the work piece faster for larger diameter circles. I want to do some sort of compensation to help with this. The coasters are very absorbent, so the lines look thicker if the speed is slower. A consistent speed will help the quality of the work. 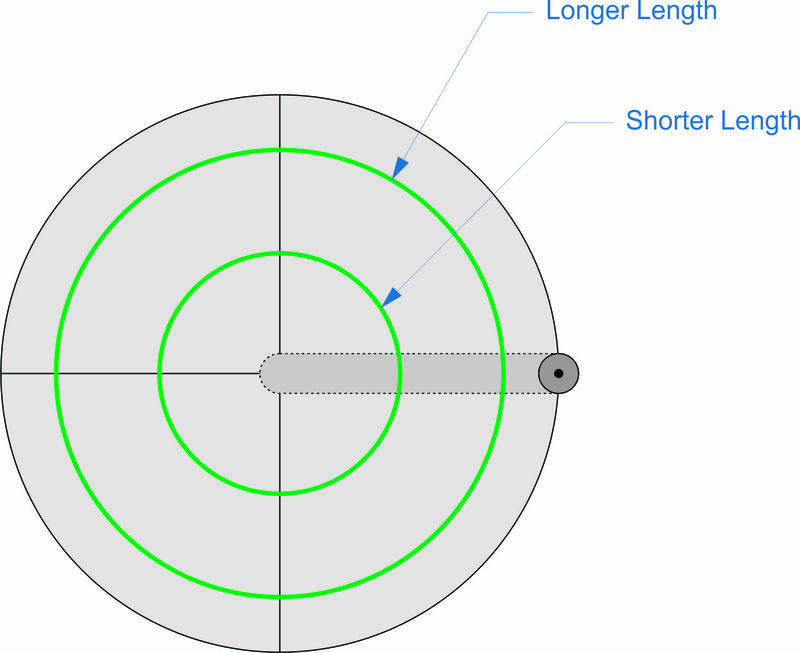 Since the lines are all very short, the easiest way to compensate for feed rate is to use the current radius. 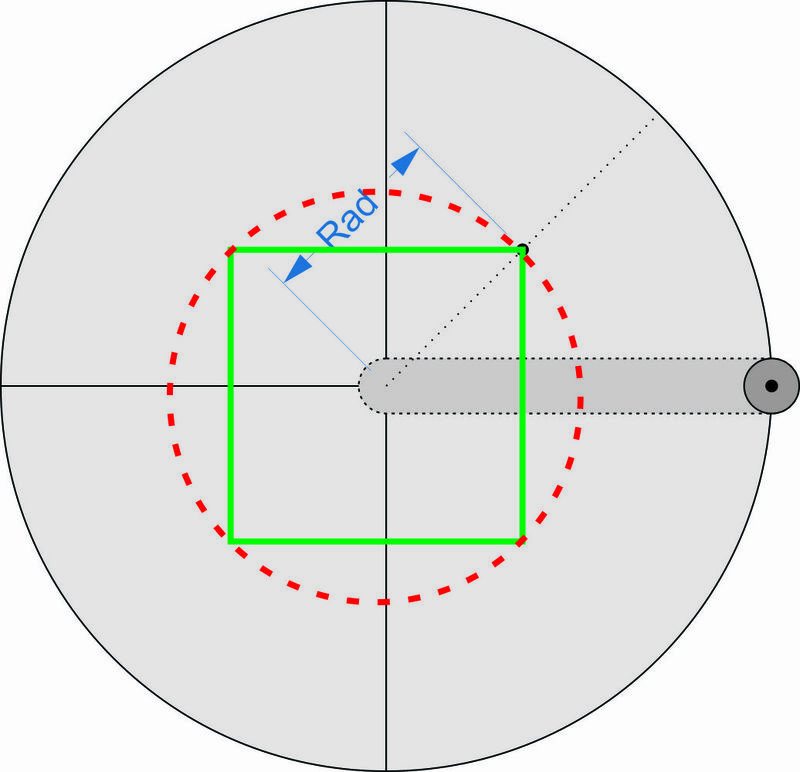 With a simple circle, Grbl thinks the machine moved 360mm. The real distance is easy to to calculate from the perimeter of that circle. We can compare it to the 360mm (full circle) and apply the ratio to the desired feed rate from the CAM program. Here is a video of it. The machine is rerunning a file to see the repeatability. I would like to automate the preprocessor. I think a Raspberry pi, might be an easy way to do this. It would sit between the sender and the controller. Here is a quick update on Coasty. Several people have asked if I am releasing the source files or selling a kit. I am adjusting the design to make that more viable. The original version was made with parts I had laying about and not necessarily the best design choices for an open source project. Originally I used an TR8-8 ACME thread lead screw. It was mounted to the motor by drilling a hole in the lead screw and epoxying it to the motor shaft. This worked well, but you needed a lathe to drill the hole and a special low backlash nut. The axis was also a little loud with and all metal design. I changed to use a GT2 open belt cut to length. 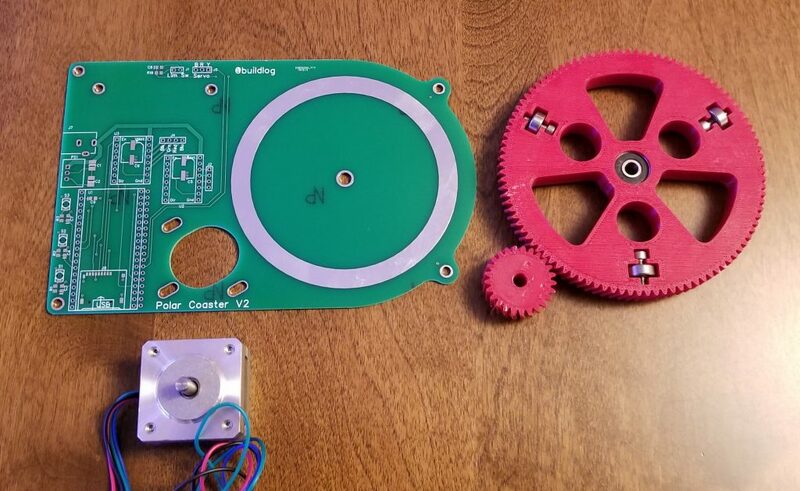 Belts and pulley are really easy to get and don’t cost too much. Need to shorten some wires after testing. There were some issues with the EleksMaker electronics that I did not like. The laser circuit did not appear to have a pull down on the signal and it tended to fire if the Arduino was not pulling it low. This would happen during reboot and other scary times. The wiring was also quite a pain. There were no connectors for the limit switches so you had to directly solder to the Arduino Nano. I changed to use a custom PCB that is the entire rear panel. This contains all of the circuits including the limit switches. Building a Coasty was a little like building a ship in a bottle. Now the bottle has no bottom and there are less parts inside. The front door now has a window. This makes the machine more fun to watch and no glasses are required. I have one build and am testing it for a while. If all goes well, I will release the source files and consider a kit. You are currently browsing the Buildlog.Net Blog weblog archives for the CAM category.